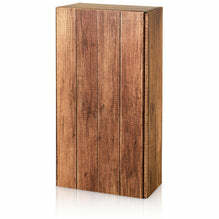 Gift box for three bottles of wine or sparkling wine up to 360mm in length. 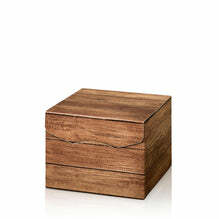 The natural-looking wooden look of this packaging is the ideal basis for many gift ideas. The offset printing with matt lacquering ensures an appealing feel. The inside and the separate insert are natural brown! With the matching DU-LOG shipping box , gift boxes are PTZ-Post-tested / DHL-Certified. This means that your content is also safe for your customers. Present boxes have a separate bottle insert, which separates the bottles from each other. The interior can be adjusted to different bottle lengths by means of pre-cut, foldable corners. If you do not need a subdivision in the packaging to pack other products, you can remove this insert.